Unlike elections in the past, the atmosphere was largely peaceful in Baramulla, barring one incident where a 13-year-old boy died due to pellet gun injuries in Handwara after polling hours. While Baramulla registered 34.71 per cent voter turnout (39.1 per cent in 2014), Jammu, the other Lok Sabha constituency that polled in Phase I, registered a turnout of 72.16 per cent (67.99 per cent in 2014). Overall, 91 seats across 20 states went to polls in the first phase of Lok Sabha elections. In four of these states, i.e. Andhra Pradesh, Telangana, Uttarakhand and Arunachal Pradesh, all seats have been polled. While Andhra and Arunachal witnessed a voter turnout of 66 per cent each, it was 60 per cent in Telangana and 57.85 per cent in Uttarakhand. Maharashtra (seven seats) and Uttar Pradesh (eight seats) polled 56 per cent and 63.69 per cent, respectively. In Baramulla, though nine candidates are in the race, it is a four-cornered contest between Mohammad Akbar Lone (former speaker of the J&K Assembly) of National Conference, Raja Aijaz Ali Khan, (former state IGP) of People’s Conference, Abdul Qayoom Wani of PDP and Engineer Rashid, former MLA from the Langate Assembly constituency in Handwar. As many as 24 candidates are in the fray in Jammu, but the fight is primarily between sitting BJP member of Parliament Jugal Kishore and Congress’ Raman Bhalla, a former minister and two-time MLA from Gandhi Nagar Assembly constituency. Districts in Jammu parliamentary constituency saw brisk polling through the day, with Samba on the international border recording the highest turnout at 75.07 per cent, followed by Jammu at 74.5 per cent. The twin border districts of Poonch and Rajouri recorded 70.4 per cent and 65.7 per cent turnout, respectively. Internet connectivity remained shut across districts barring Srinagar, Budgam and Ganderbal in central Kashmir. Police said it was part of its routine security measure. As voters trickled into polling booths to elect a new MP for Baramulla, with every beep of the EVM, they sought to remind the outside world that Uri, 100 kilometres north of Srinagar, is more than the subject of prime-time television debates and a movie title. “Apna numainda chunna zaroori hai, taaki humien koi bhool na jaaye (It is important to choose one’s representative, so that we are not forgotten),” said 88-year-old Haji Mohammad Sabir Mir, the walking stick shaking in his hand. “We have concerns – the youth need jobs, and we need respite from the endless talk of war,” said Mir. At the Uri degree college, first-time voter Rabia Ali said, “We need representatives who won’t abandon us. That is my hope.” In the 2014 elections, the Baramulla parliamentary constituency comprising 15 Assembly segments, recorded 39.14 per cent voting, the highest among the three Lok Sabha seats in the Kashmir region. 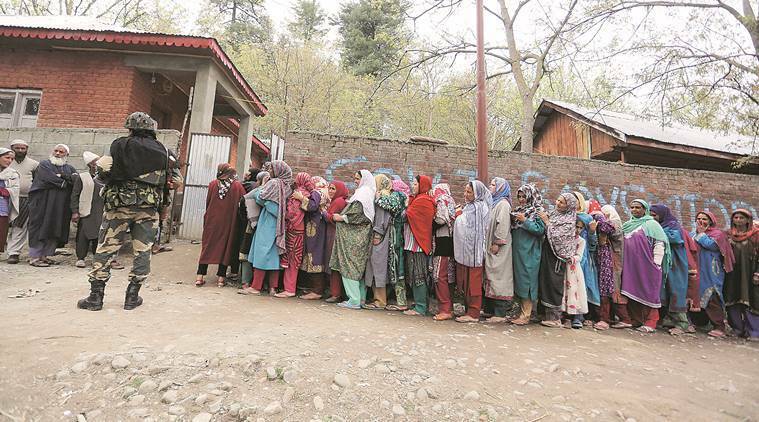 If voter turnout in Uri was the highest at 57 per cent in Baramulla district, booths were deserted in Sopore. At the Boys Higher Secondary School in Sopore that housed six polling booths, only 17 votes out of 3,041 were polled by 5 pm. The entrance of the school was locked and voters were allowed inside only after proper frisking. With just an hour left for polling to close, only 78 votes out of 4,534 were polled in the Boys Degree College. Sopore was the only Assembly constituency that polled in single digit at 4.3 per cent. Contrary to Sopore, nearby Handwara town was bustling. At the Boy’s Higher Secondary School, which housed two polling stations, men and women stood in long queues waiting for their turn to cast votes. The Handwara Assembly constituency in Baramulla recorded the highest turnout at 60.3 per cent. Kupwara district saw the highest turnout at 51.7 per cent, Baramulla district the lowest at 24 per cent and Bandipor 31.8 per cent. About the 13-year old boy who died due to pellet gun injuries, Kupwara Deputy Commissioner Anshul Gard told The Indian Express that the incident happened around 7.20 pm at Mandigam area of Handwara when security forces were being withdrawn. “We have reports that stones were thrown and in retaliation, they (security personnel) must have used the pellet gun,” he said. Local health authorities in Handwara said the boy was shot was shot from close range. “He was aged around 13-14 and suffered multiple pellet injuries on chest, neck and abdomen,” said Dr Rouf, Medical Superintendent, District Hospital, Handwara. “He had sustained multiple pellet injuries and was brought dead to the hospital,” he said. In Rajouri district, voters were undeterred by the firing from across the border. Around 2 pm, troops at a Pakistani post in Chakla area across Munawar Tawi fired half-a-dozen rounds of small arms at frequent intervals. Nearly 500 metres away on the opposite bank of the river, stood men and women in queue in the premises of the Government Middle School, Bardoh, eagerly waiting for their turn to press the EVM button. Bardoh, the last Indian village along the LoC in Jammu and Kashmir’s Akhnoor sector, has 986 voters. The school, in which polling station has been set up, too happened to be the last building along the LoC. None of the voters seemed to pay heed to the shots fired by Pakistani troops clearly audible. Akhnoor recorded 77.97 per cent polling. There were complaints of EVMs not working at some polling stations in Poonch. Polling in Shahpur was stopped for a while after voters complained that the EVM button opposite the Congress symbol was not working. People at a polling station in Mandi held a demonstration alleging they were being compelled by a para military official to vote for a particular party. Deputy Commissioner, Poonch, Rahul Yadav, said complaints about EVM malfunctioning were received from four polling stations out of a total 451 stations in the district. The EVMs were soon replaced, he said.